Unfortunately most do not teach the essence of Tai Chi, Chi Gong, Yoga or any method/practice for reaching the most unified state possible. People want to learn forms and to put a label on everything. 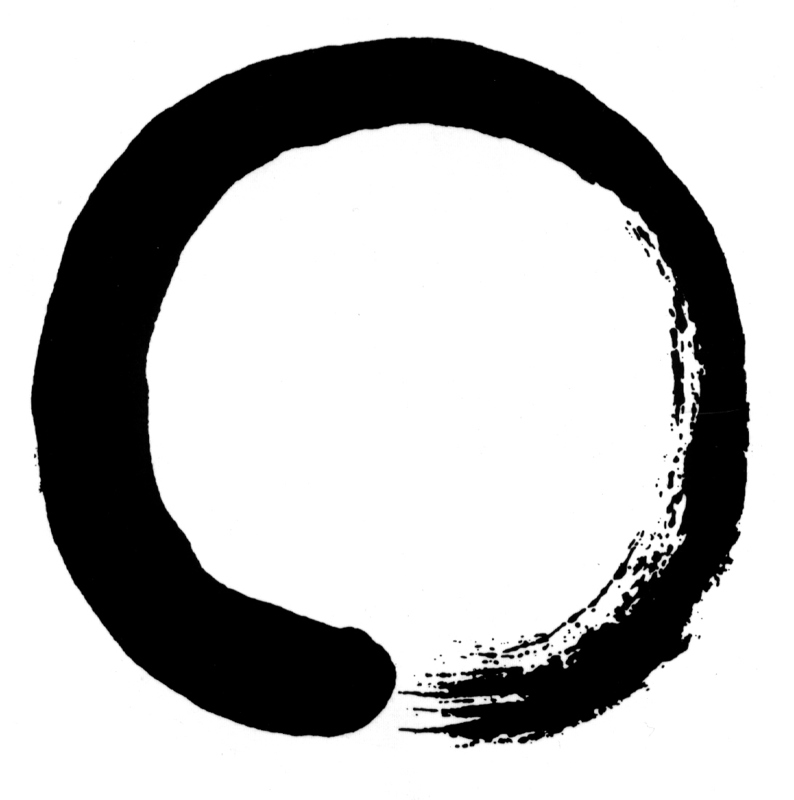 The Tao cannot be attained without a body. Truth cannot be attained as long as there is a physical body. We need the body to become realized beings. To completely understand the Way of things and ultimate truth, there cannot be a physical form. Discipline, concentration, and insight are the three essentials. Being centered in the midst of circumstances, is finding the mysterious pass. Clarifying the mind, is miraculous experience. Seeing the essence of mind, is crystallization of spirit. Merging mind, body, and spirit into one completely unified state existing in harmony, is refining the immortalized consciousness. Having a body outside the body, is release from the matrix. Breaking through space/time is perfect attainment/enlightenment. When accomplishment is fulfilled in spiritual practice, character is well developed and one directly transcends to completion all at once; physically and spiritually sublimated, one merges with the Tao in reality. First of all, what is meant by learning? I am not offering an opinion, I am looking at the fact. Is learning a process of accumulation of knowledge? From that knowledge I act; that is, I have stored up experiences, memories, and from that I act. Or, is learning a constant process without accumulation and therefore learning is acting? Go slowly, I’ll go into it. It is not that I first learn and then act according to what I have learnt, but learning is acting; the learning is not separate from acting. One is going to learn about fear, or about what to do, how to live. But if you have a system that tells you how to live, or a method that says, “Live this way”, then you are conforming to the method which is established by somebody else. Therefore you are not learning, you are conforming and acting according to a pattern, which is not action at all, it is just imitation. So if you learn what are the implications of methods, or of systems, then you will put away methods and systems; then you are learning about what you are doing and the very learning about life is the activity of life – right? Have I made it clear? Living, learning and acting are not three separate things, they are indivisible. A few days ago after breakfast, I laid down to meditate. Almost right away I found myself in the forest behind my house. Only, there was no snow like there should have been and everything was very green. It was warm outside and very nice, so I walked around for awhile until I was approached by some woman. She had a sort of golden brown skin and when I looked closer, it looked like there were actually little specks of gold embedded in her skin. She seemed to be glowing too but not very bright, like her skin was radiant. She came up to me and began communicating with me in some non-verbal manner. Like she was thinking and I could just get a direct transmission from her. Sometimes I would get actual words. I asked her who she was and she said she was a goddess. I asked her where she came from, and she asked me if I had ever seen her temple before. I was confused by this, because she asked it like she was surprised I had not seen it before, and how I didn’t recognize her. She took my hand right then as she understood that I didn’t know what she was talking about. She explained how her temple was “white but not bright white”, I remember those words exactly. At that very moment, a flash of an image popped in my mind’s eye. I saw a very large and beautiful temple that was crystal clear, like it was made entirely from quartz crystal. It was then that she took me to a large river. We were just there instantly, and not in the forest behind my house anymore. She turned to the water, and out of her chest where her heart would be, a bunch of little things started flying out of her. I thought they looked like bees at first, but when I looked closer I couldn’t tell what they were. They looked more like energy and not like they had a distinguishable form. These small things flew into the water and a whirlpool began to happen. Out of the center of the whirlpool, a sphere of spinning water ascended into the air. Then the ghostly images of what looked like people sort of, appeared in the air, as if they were being projected out of this sphere. The images included men and women and they looked to all be celebrating or having a really good time otherwise. They were not quite people I noticed. Some had different color skin and were shape-shifting into other things. One man looked down on us as if just noticing that he was being watched. He had human features and same color skin as a Caucasian. He began to argue with the goddess I was with. He was clearly in some sort of leader position. He was saying that we were not allowed to come where he was. We were not allowed because she was trying to bring me there with her. So, pretty much, I was not allowed and that was why he was denying us. He kept saying that you cant bring one of my kind there, it’s strictly forbidden. Without too much more of an argument, she conceded and she grabbed my hand again. Next thing I know, I am somewhere else once more. This time I am standing near a house with what looked like clay walls. We were outside of it, in the middle of a forest I have never seen before. I realized that she was trying to hand me something. It looked like a sort of plain doughnut without a hole punched in it. It even felt like a pastry but was more firm. she told me how I can repel negative spirits away from me and showed me once again in a direct transmission how to do this. It is hard to explain. One more time, she sent out those small things from her chest where her heart would be and they flew into the clay wall of this house. Then all sorts of disturbing and threatening forms that looked to be coming right for me, started coming out of the wall. I realized she was giving me a chance to try what she had shown me and that these things could not hurt me if I did it. I held out the object she gave me and its like I just knew how to make this loud, humming sounding vibration come out of the very center of my being. I was not actually humming with my mouth. It was like I was sending out a massive vibration. I had to close my eyes when I did it, to focus enough and it sounded like it was so loud that it almost made my ears ring. When it would get the loudest, I could see behind my closed eyes a sort of blue sphere of light that would turn yellow like the sun. When it was yellow, was when the action was finished. Like I said, this is very hard to explain. I began to do this with the object over and over, making this humming sounding vibration. I was fascinated with how it felt to do this. After awhile of doing it, some people came out of the house complaining saying I was being too loud and that I had to stop. They didn’t look menacing but they were really annoyed. I noticed the goddess was nowhere to be found right then. I tried to show one of the people what I was doing, but no matter how hard I tried I could not do it again now that she was gone. Instead the object she gave me crumbled in my hand. I closed my eyes in a sigh. When I opened them I was shocked to find myself back in the forest behind my house again. I saw people getting up like they were passed out in the grass and just waking up. I went over to them and when I did, this creature that was very beautiful came up to us. She looked like she had human-like features and body, but she had a sort of purple complexion. I asked her what she was and who she was. Again, like with the goddess she spoke only to me in what was a non-verbal sort of communication, a direct transmission. She was a fairy. I know that might sound crazy. 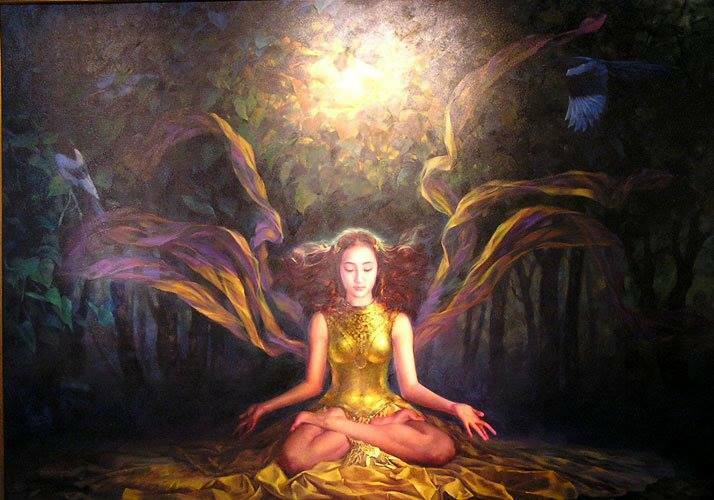 I have never had a dream before or meditated and seen goddesses or fairies. I was shocked in this meditation while she was explaining to me what she was. But I could feel in me that she was in fact a fairy, just as much as I felt that the goddess I had seen before was exactly that. She led a few of us to a tree and I was wondering what she was going to do. She just grabbed some bark with two hands pulling to the right. For some reason I couldn’t imagine why she would be doing that, at that moment. Until the bark opened up just like a door would. My jaw dropped and I saw very steep stairs and two white ropes hanging on each side of the staircase. I knew right then that this was her home. I climbed the stairs by grabbing the rope on the right to help me up. I noticed how I was shrinking as I was going up the stairs. Reminded me of Alice in wonderland. I was very lucid during this whole experience. When we got up the stairs it was a small home with a kitchen, a table and two other rooms. Another, male fairy popped up out of thin air and started heckling the first, female fairy that led us there. He was messing around with her in a joking sort of manner. She told him not to go invisible and startle her like that. She didn’t seem to appreciate his behavior and as they were bickering, she started to shape-shift many times, into all sorts of different forms. Some of these forms looked animated almost, or like a cartoon character would. Except it was clearly still her and she was just making herself look different. I noticed she was changing form almost as if it was part of her expression and how she was feeling while she was talking to him. She was very funny and kept making quips at him. She was more clever than he was and had a brilliant way of making him realize how he was acting. I wish I could describe some of the forms she was changing into. Some of them were so bizarre and yet pleasant to see.. Most would be nearly impossible to explain. One, which I like allot, was like a cloud inside a transparent body. She went to this one a few times. The cloud had eyes and a face but it was inside of the transparent body. If you could give a cloud a face and have it look real, it was like that. She even showed me how she looked if she were human. She was gorgeous as a human, with light brown hair and bright green eyes. After that, she returned to a humanoid with purplish color skin again. I remember she had books on her table. One was hand drawings that she said she had done. Most of them were faces, portraits maybe of actual beings? One of these drawings stood out to me. It was the goddess I had been with before. I told her about this and about the goddess. She just smiled as if she knew who I was talking about. She wouldn’t tell me anything about the goddess tho, like it was secret. I told her about the whirlpool and the sphere of water that projected those beings in a ghostly image. And how she was trying to take me to where they, were but I was not allowed. She said that they were water fairies. She said they can be stubborn and do not like outsiders. Another book had all these symbols and I could hardly read any of it. I remember some symbols I could understand. One was protection, another was invisibility, and another was gateway. There were a couple others I could read, but cannot recall now for some reason. I have no idea how I knew what these symbols meant. I asked her what they were. She looked at me and was surprised saying that I should not be able to read them at all(know what they mean). She said that was her book for studying glyphs. She was not very good at glyphs and she was trying to learn more. I asked her about the invisibility one. I asked if she could make me invisible or if there was one that could let me stay there with her longer. I knew I could wake up any minute and I didn’t want to leave. She explained that the invisibility one would only last an hour to an hour and a half, unless I meditated more. She said if I meditated more it would have a more lasting effect, up to 6 months even. She said that right now as I was in her tree, that I was invisible to the physical world and laughed at me. I knew she was being sarcastic, and exactly what she meant. I quickly discarded the idea of invisibility. She said that when I was ready to wake up, I had to wake up. That she couldn’t keep me there. She can take me places and show me things, but my time there was decided by something greater than her. She wouldn’t explain what she meant by that no matter how I asked. I asked her about the other glyph I saw, that was “gateway”. She said that one is to come into and out of the physical realm. It is to make a gateway for that. She said that you need an anchor and that is why she is living in that tree. The tree is her anchor. She was asking one of us to help her with laundry and she was looking in her fridge and complaining to the male fairy how there was pork in there and all sorts of unhealthy stuff. He remarked that the brief times he is able to eat food, he wants to enjoy himself. She said that he is harming himself by eating like that. He didn’t seem to care. She was very upset that there was so much pork. I remember her saying, “pork, pork, pork, so much pork!! !” I didn’t understand until after I woke up later on, why she would need food or clothes. She needs them for if she is coming to the physical world. She had even explained to me that her tree was the anchor for her to come into the physical world. She said that normally she would never discuss glyphs with someone like me, but since I was able to read some of them she felt it was alright to explain at least the ones I could read. The male fairy kept interrupting her and me even when we would speak. He didn’t like how she was telling me so much. It was hard to talk to her at that point because of him. Right then the phone rang and I was pulled awake.